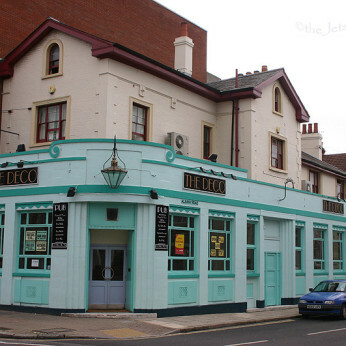 Whether you’re after a quiet drink on an otherwise boring afternoon, or a night of awesome metal and rock tunes, The Deco is the place to be. With reasonably priced drinks, including some great offers, as well as fabulous pint cocktails and events happening pretty much every night of the week, there’s something for everyone. Open between 12pm and 12am seven days a week we offer a great selection of drinks, including real ales, ciders and soft drinks. On top of that we have great bar snacks including monster munch (pickled onion, nom), biltong, pretzel pieces, pig and nuts. Join us on one of our weekly nights of fun! From the ever-popular quiz every Sunday, plus the DJ nights in between, there’s always something going on. Popular with students, locals and like minded regulars that are pretty much part of the furniture, you’re bound to feel right at home. Sidenote: That’s our manager there. Standing in the doorway. He’s really tall.